Granitas have never exactly captured my imagination. Flecks of flavored ice in a bowl seemed rather dull, and their place in the dessert repository was kind of lost on me. Trust me, if I’m hoping you’re going to bust out some salted caramel dark chocolate mousse and you come out of the kitchen with pale icy chips? It’s going to be hard for me to feign enthusiasm. But now I get it. People, granitas are a Snoopy Sno-Cone Machine of our kid dreams. They’re the perfect antidote to the sticky, oppressive summer days to come — frosty, crunchy and tart — tossing out that annoying plastic crank in favor of the unbranded simplicity of two forks and a roasting pan, and swapping the unnatural syrups in frightening hues for fresh fruit juice. In this case, bold lemon and mint. I recently discovered the awesomeness that is lemonana: frozen, slushy fresh lemonades with fresh mint, often served at Israeli restaurants. They are, singlehandedly, the most refreshing thing I have ever tasted — bold and barely sweet — and although they sure are delicious from a glass, a granita is an even more perfect vehicle for these flavors, and more fun, because you can eat it with a spoon. Or a fork. And it crunches, oh, how it crunches. Granita’s selling points don’t end with being more appealing than ice cream to a certain preggo (though really, what more do you need to know? ), more refreshing than an air conditioner on turbo on a sticky summer day, and the best thing since a Snoopy Sno-Cone — they’ve got something going for them that sorbets, sherbets, ice creams and gelatos lack: not just the ability to be made without a machine, but the insistence that it’s the only right way. You won’t get those fleck-y ice bits in a churner, you’ve got to rake them up yourself with a fork. And then try not to eat them all before sharing. Oh, and let’s say you’re not baking a baby right now? One word for you: Limoncello. Can you imagine a glug of that over your dish? Oh baby indeed. Just promise to have some for me, too. Clean and wash the lemons. 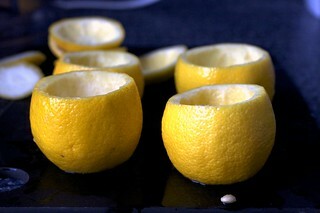 Cut off the top quarter of the lemons and slice a thin bevel off the bottom, so they can stand up straight. (You can skip this step if you don’t want to serve them in frozen lemon cups.) Using a grapefruit knife, carefully remove all of the lemon flesh and juice (working over a bowl ensures you won’t lose any), being careful not to cut through the bottom. 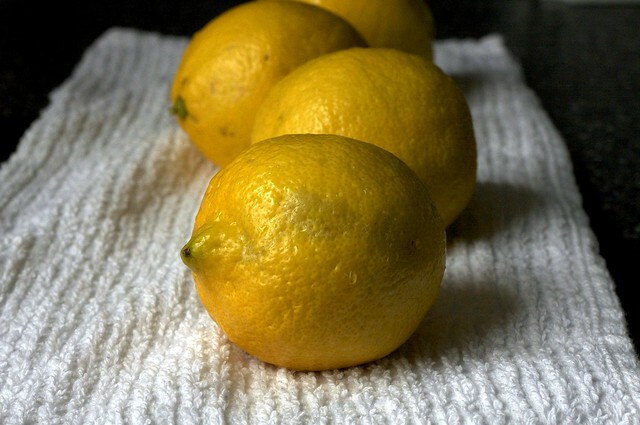 Stand the lemons on a plate or cookie sheet and freeze until solid. Using a food processor (a blender will work as well), toss a handful of washed and dried fresh mint leaves into the work bowl. (I used about 25 to 30 leaves from 6 to 9 sprigs.) Add the scooped out lemon flesh and juice, and pulse until mostly pureed. 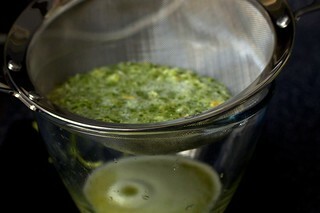 Let mixture stand for 15 minutes, so the mint releases its flavor, then press the mixture through a fine-mesh strainer. You’ll end up with approximately one cup of lemon-mint juice. When the granita is frozen, rake until glittery. Scoop into frozen lemon shells (or, you know, plain old dishes) and serve before Deb gets to it. FABULOUS!! Cannot wait to try this dish!! It’s not Ben & Jerry’s, but if you say it’s that good… I’ve trusted you in the past, and only good things have ever come of it XD. Love the presentation, too. Lovely presentation!!! I felt in love with granitas in Sicily, where they have them inside brioche rolls for breakfast…. hahaha those Italians, who are they all not morbidly obese?!?!?! There’s nothing like a nice frozen treat on a warm day. I def going to try this. By the way, great job with the photography. As a newbie blogger and food photog myself, I am totally inspired. Thanks. Thanks for posting the perfect antidote to this hot weather! Ha – I remember being like 10 in my kitchen attempting to make this and failing miserably – perhaps its time for a retry? If the grocery store was open I would be there right now buying fresh lemons. Looks like a wonderful treat and I can’t wait to try it out. lemon and mint, limoncello… that screams summer. what about lime and mint, and a bit of rum if desired for a mojito-inspired granita? damn, deb, you have me yearning to go buy that 9×13 pyrex i know i need otherwise. and i only wish i could so masterfully gut a lemon. In Rhode Island, we grew up with frozen lemonade stands. Who knew we were just one step away from being fancy? Yay! Another wonderful use for my mint bed! I bet my 3 year old would love this too. My mouth is watering.. what an easy summer dessert! And the lemon cups make it look so fancy! Can’t wait to try it. Just a thought, but do you think this would work as well using a juicer? The one I have leaves the lemon half looking like your bowls. 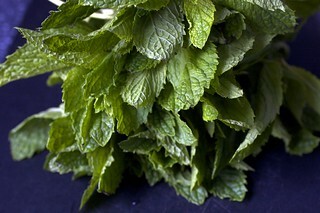 Might be difficult to get the mint truly infused, but since leaves are edible maybe they can be chopped and mixed in. Thanks for the ideas – as you can see, my mind is already churning! I’ve been totally hooked on anything icy and fruit-flavored, so you totally got me with the name of this yummy treat. I had a snoppy sno-cone machine! I will def be making this, as I’m sure it will be better than the ones I used to make! This is a great base recipe for so many other types of fruit granita! I have so many cherries and berries going wayward, do you think I could do something with them are are they too thick? Rhubarb is nice too. Ahhh, I love summer food! wait, i’m sorry… do you freeze the guts of the lemon too? or just the shells. i assume just the shells, but i wanted to be 100% sure! Oh, this does sound refreshing. Now I just need to make room in the freezer for a roasting pan! This looks so wonderful and refreshing! And I love how you’ve presented it – very chic. Oh boy. This looks so good. 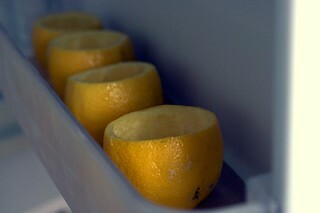 I do something similar with those ever wonderful Meyer lemons. More sugar? less water? Can’t remember as it’s “to taste”. Heap a big scoop of granita in a frozen martini glass and add vodka. Whoa baby. Let’s see, how much longer ’til you can drink? This will be great once it finally warms up here! Looks delicious! I also saw your recipe for smore pie and blackbottomed cupcakes. The pie looks divine. I’ll be making on the fourth! However, the site for the cupcakes directs you to the pie. Can you please re-do it? Thanks! Keep up the amazing recipes. Can you make these, put them in their cups, and then put the back in the freezer to eat the next day, or will they freeze completely??? Sounds like refreshment to the max! It is hot here and this sounds so refreshing and delicious. I’m going out to my herb garden to cut some fresh mint and making it right now. That looks so refreshing! I will have to try this now! I went to school in Philly, the home of the water ice. Sort of the same thing, although this looks considerably more gourmet than Rita’s, the ubiquitous Philadelphia water ice brand. Katie — It is best to re-fluff the granita right before serving it. Sometimes, the little ice bits merge. Kelly — You scoop the lemon flesh out. OK, NOW we’re talking. Cool and refreshing is just what we need today. When I was pregnant with my second, my craving was key lime pie or lemon icebox pie, the tart-er the better. I ate tons of it and any other dessert was cast aside like an ugly step-sister. Now, that boy loves the tart stuff too. So, any connection here – what mom craves while pregnant is what the child will crave once born?? This is lovely! And FINALLY!!! Someone else who remembers the beloved Snoopy Sno-Cone machine. Oh, how I wanted one! I dreamed of going back and forth between the easy bake oven and the sno-cone machine, making treats for all. *sigh* Adding lemon to my shopping list!! While I realize your current state does not allow this experimentation, I wonder if this would work well with limoncello–I’ve been thinking of making my own again sometime soon, and this could be such a yummy alternative to just serving it in an aperitivo glass. Oh, this does sound perfect for a hot summer day. Who says every treat needs to be reall fussy? mmmm.. that would be good on a hot and sunny day like today! oh, these look fantastic as always! what a great idea, just in time for the warm weather we’re having in DC! I agree that as a dessert, granitas leave a little something to be desired. But if I could have this instead of some plain old roadside lemonade, I’d jump at the chance. It’s all about context. oh man I had the snoopy sno cone machine way longer than was appropriate and the easy bake oven. Looks yummy but I’ll have to forgo the mint – I don’t do mint. It makes me feel like I’m eating toothpaste. how delicious! i’m gonna try this and surprise my husband w/them. we had THE.BEST.GRANITAS last year in Italy – fresh lemon and orange, outside of Pompeii. The addition of mint sounds yu-umy! I’m crazy for limes at this time and wonder if this would be as awesome as I think! A small point: the link to black bottom cupcakes takes you to the s’more pie link. These look amazing! Making me so glad I just planted a mint plant in my garden this week! A side note: All this preggo talk is making me nostalgic for the time (1 year ago) when I was making baby food for my last baby! I think you might like to check out a website that helped me with my babies: wholesomebabyfood.com . . . They have great recipes for making your own baby food. A baby in your house is going to have to have a more sophisticated palate than most, and the recipes help with that! Deb, thanks for sharing. I think granita is an under-appreciated dessert. Sure it’s not the same as something more decadant, but come summertime it really can’t be beat. Oh- I can not wait! I will push that snoopy sno cone machine out of the way and make it for real! This looks delightful and I LOVE the lemon cups. Perfect. My one experience making granita was attempted in a small apartment freezer that was quite full to begin with. I precariously set a pan of hibiscus granita in to chill. An hour later I opened the door to find my freezer contents bathed in a pink sticky mess. Ugh. I haven’t tried granita since, but should now that I have a ‘normal’ size freezer and I can’t resist lemons! Wow, chic snowcones. This is totally a new thing to me. Learn something new everyday. Sounds refreshing for a hot summer day bar-b-que. I had that snoopy snow cone machine! Making snowcones with that thing is one of my favorite memories, although it did always kind of hurt your hand. Anyway, your granitas look much more age appropriate and delicious. We have a little heat wave going on here, and this is the perfect solution! Thank you! I love that you served it in the lemons. So cute! Wow! These look so refreshing! Especially since it is already 95 degrees in Houston! These look like such a treat! Lemon and mint is one of my absolute favorite combos! Can’t wait to try this out. Hmm, I wonder what a lemon, mint and iced tea granita would be like? Those look great! I love the presentation of them as well. I have a recipe for watermelon mint granita at home that I have been wanting to try, but haven’t attempted. I may try it out of inspiration from this post now! I craved lemon the whole Time I was pregnant! I made your lemon cake, lemon bars, lemon tarts… This looks delightful. i couldn’t think of anything else after you said salted caramel dark chocolate mousse. THAT’s a recipe i’d cherish forever! Looks so good! 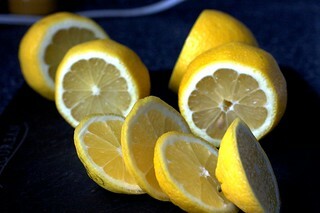 And I love lemon in the summer time its so refreshing. This looks so refreshing! And serving it in the lemons is too cute! Oh my, I LOVE your blog…and photography. Now I know why I didn’t pitch the half dozen lemons I juiced for whisky sours last week and looked at just last evening. Just by coincidence, the mint needs to be pinched back, too. This recipes looks great and I love the presentation. Unfortunately, I cannot stop thinking about salted caramel dark chocolate mousse now. I googled and found one recipe (milk chocolate) that the blogger deemed somewhat unsuccesfull. Do you know of any recipes? Ronnybrook Milk Bar has amazing lemonana. I want one ten times a day but must resist because they’re $4.88 each–an outrageous price for ice with some lemon and mint. Must start making them at home. That looks like the perfect summer dessert. Now if only the weather in my area matched. This sounds perfect for my lemonade loving man. I can’t wait to try it! Once you are done baking, you should try the Mojito Granita from the Perfect Scoop. I made it a few summers ago and it was beautiful in all of its stages of doneness (and remeltingness on a hot summer day). Here in LA people sell the unnatural syrup version but also home made versions on the street. Mexicans call them raspados, us Salvadorans call them minutas, but they’re all just ice with flavoring. My favorite is a home made one with tamarind juice and pulp. But a mojito one also sounds refreshing. Ooo, ooo..can you imagine this with grapefruit juice? Oh, man! This looks wonderful. I wonder what the flavor and texture would be if I froze the liquid in ice cube trays and shaved the cubes with my Hawaiian snow cone maker. So pretty! I made blood orange granita a couple weeks ago while they were still available in Florida. Think I have a divine recipe for coffee granita from Nathan Lyon. Could eat a different one every night! Yum. This would be perfect on a warm summer day… Add some pink grapefruit juice to that and it would be so yummy! I love lemon. So much so, that I didn’t even care what the pale chip looking things were in the lemon peels in the first picture. After reading through the recipe, my mouth is watering like c-razy. Thank you for the awesome idea. Yep, mouth still watering…soon to be drool. Would this mix work as a sorbet in an ice cream maker? Thanks. I love this! Perfect for gatherings! I like the photography on this site. making the food look good. I’m completely addicted to icy things. This will be heaven indeed. My reaction was the same as yours – when I saw the subject I nearly just clicked away, but if you like it, dammit I’ll probably like it too. I made a great coffee granita last winter: 1) leave half your venti latte in the car overnight, 2) scrape out of cup with fork. Voila! I dunno Deb… I just don’t know. Perhaps I will believe that granitas are better than a giant bowl of ice cream in the depths of the sticky, smelly Los Angeles summer that’s about to descend upon my life. Maybe then I’ll understand. Also… lemons are pretty, fact. I loved your post, it made me smile, because when I was pregnant the only thing I craved was snow cones. I asked for them every day, but they aren’t so easy to come by, so I should have made granita instead. This looks amazing! Not a big fan of mint, but a huge fan of lemon. Would this be just as good if I took the mint out? Oh, I always love granita, and this is the perfect flavour combo for it. Wonderful! The mint in my garden is going to love this! (I may like it a little bit too…) Friday when my husband gets home from work sounds like the perfect time for this to make its first appearance at my house. I’ve totally ignored the granitas section of The Perfect Scoop, since they seem boring compared to ice cream or the delicious fruit sorbets in that book. I may finally be convinced to give one a try. granitas are awesome. especially now that the weather is heating up. super refreshing!! plus lemon and mint aren’t really hard ingredients to come by. especially since mint grows in my yard like a freakin weed. Simple and delicious – I am smitten. I got to a point in my second pregnancy…..probably around the last trimester….when I ate ice chips like they were candy. I think you’ve found the better and more delicious solution here!! My mocktail of choice when I was pregnant was orange juice and ginger ale with a splash of grenadine. That might make a nice granita flavour too! Oh, I forgot to tell you : one of my friends made frozen grapes (not pickled, but hey…) : she put grapes, some water, a little bit of sugar, in the freezer and scrape with a fork a few times. This way you have delicious frozen grapes, it’s very refreshing to! Mmm this looks delicious. The weather now’s perfect for such things. Can’t wait to try it! This sounds wonderful for the hot summer months. Lemon and mint are two of my favorite flavors and together — nearly unbeatable! Hm…an orange/mint granita with a splash of Grand Marnier might be pretty good, too. Oh Lordy! I am a long-time reader and preggo too at the moment Deb :) – I was super-excited when you announced yours too! Have been trying to perfect an alcohol-free mojito (lime and mint) but this sounds even better. (and goshdamn, don’t I want the limoncello drizzled over!) And ideal for the current heatwave over here in the UK! Just saw another comment hinting towards Cherry Granita – ooh la la! 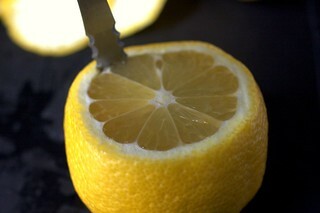 I am going to fiddle and tinker with this idea now you’ve got me started…..
Mmm…I love lemonana! Makes me homesick for Israel, where we used to buy lemonana sorbet. I will definitely try this at some point. This looks so refreshing! It may be just the thing I need for a mid-summer house-warming party! Made this last night with lime and mint. It was super-tasty. I was addicted to anything Lemon with both of my pregnancies. Pineapple was also a major weakness. That photo of the lemon cups on the black background is beautiful! yay! Snoopy sno-cone machine . . . . bought it for my nieces/nephews a couple years ago so their childhood would be right! I’m excited to try this homemade version at home. Since I lived in Israel I was excited for the shout out to “limonana”.The best I ever had was at the open aired mahane yehuda souk or gra street in Jerusalem! (although it is delicious at every street corner along with the awesome falafel & all the fixins, the ubiquitious freshly squeezed juice stands, and these days–the coffee frappuccino’s too, called barad (meaning thunder) . . . . Ah! memories . .. Deb, haven’t had a chance to stop by in a while, so glad I came just in time not to miss this refreshing summer treat–thanks you! Hope you are feeling good. And, as ususal, gorgeaous photograph. It tends to be a simple syrup made with some sort of fruit juice or flavoring and vinegar, reduced down to a thin syrup and then mixed into water. A kind of a home made gatorade if you will. Why do you need 2 forks? What’s wrong with using 1?? How lovely! And this…from a confirmed chocoloholic. I loooooooove Lemonanas. I ordered one every chance I could get in Israel. I am making this recipe this weekend for sure!!! I used to work in a dumpy part of west London (by the gas works, since you asked) and its only saving grace was that, a 20 minute walk away, was an Italian deli that made the most divine parmesan, rocket (from a carrier bag, cut fresh from the owner’s garden that morning) and tomato, drizzled with olive oil ciabatta sandwiches. In its freezer cabinet were these lemon granitas, each served in their original lemon casing, which made the perfect dessert. I remember being eight months pregnant and yet still, even in 30 degree heat, it was worth the trek there for the most wondrous lunch. Thanks for the memories, Deb. 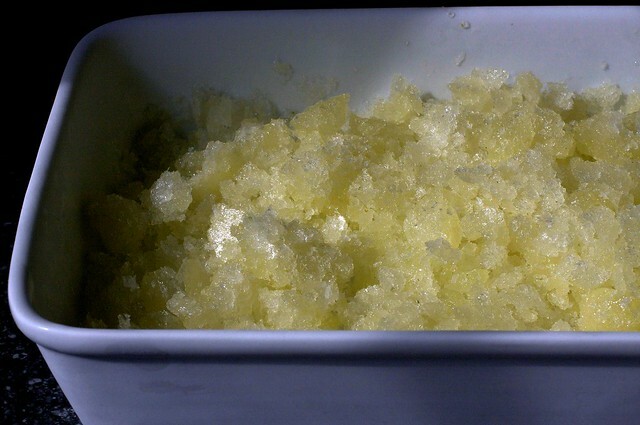 I have always wanted to make lemon granita and now that I saw your post I’m sooooo tempted to make it today!!! Although I think I might wait until it’s a little hotter so I can really enjoy it. This looks so fresh and crisp. Can’t wait to try it! Wow those do look more refreshing than an air conditioner on turbo on a sticky summer day! I should start having my techs show up to work sites with those ready for my customers, yum! They look delicious. I will be giving them a try soon. This looks great and so pretty in the lemon shells and would be great right now. Have to hit the store for the alcohol additive. Oh yes, I ate enough ice chips when I was pregnant that the sno-cone man would see me coming and make my large without the syrup. Plain ice shavings, though a little lemon might have helped. Couldn’t go the sugar, chocolate and a lot of favorite other things. Your site is going to be so much fun as you grow along. Looks so refreshing. The lemon shells make such an elegant presentation. I’ll definitely make these. My family loves lemon and mint. I just did my walk around my crazy lemon tree that is just about ready to produce… I can’t wait to try this out! hi deb- this sounds perfect for those hot summer nights but also could the lemon thing be inspired by the pregnancy as well? i’m not gaga over lemon desserts but when i was prego that all i craved-citrus and specifically lemons and key limes from my neighbors tree! I’m sitting if a stifling hot living room reading your post … it’s killing me :-) Looks just like what I need right now. Maybe I’ll to the market for lemons, and spend a few minutes in the freezer section before coming home to make this! lYou are right on all counts. Especially: Limoncello granita or skip right to the Limoncello shave ice. When the baby is done, trust me on this, you’ll want it on hand for those late afternoon playdates. The other mothers will love you even more. Thanks. Yum. Perfect. What else can I say? Hi Deb, this is my first comment after stalking for a while… I’m just now making this and it looks awesome. I live in Israel and it’s HOT today, we always order lemonana at restaurants but I’m thrilled to be making it at home! Oh. My. Gawd. Lemon and mint in the same place, frozen and crunchy. Wow. I am so trying this, and probably not sharing it with anyone. It sounds far, far too good for those heathen children of mine and their lurid blue popsicles. you inspire me. When I was pregnant last year, I craved ALL things lemon to quell the nausea, and this would’ve been amazing to add to my repertoire. I’m still going to try this though – summer is not quite here yet where I am with ridiculous 50-degree days in June, but just because it doesn’t feel like summer, doesn’t mean it can’t taste like it. And I can’t wait to share this with my daughter once she’s past the carrot/squash/avocado-only phase. Jumping on the granita love-train! It’s no limoncello, but probably the best thing in the world after a night of sticky, no-air-conditioning-sleep is some re-fluffed coffee granita (with or without whipped cream, depending on your guilt index). Anyways, thanks! Once the rain lets up, I am so back in the granita saddle. First time commenting on your website, but this is the third recipe I’ve tried that you’ve posted. The other two were huge successes! (Pizza, which is now a staple, and the strawberry/rhubarb cobbler. I’m already a big granita fan, so it didn’t take me much convincing. I’m curious if you tried making this w/simple syrup? I usually do that when I’ve got time and don’t mind the extra dish. can’t wait until this is frozen so i can taste it! Hopefully the rain will have let up by then. yikes, that was good. from what i remember, at least. i did at the limoncello (yum), and then ate (drank? melted?) the entire batch last night! what a treat, thanks deb! This sounds like a wonderful activity for me and the kids next week. Refreshing, healthy and fun! THANKS! Pretty!!! And these sound amazingly refreshing. Ah, the irony. A few months ago, when the weather was cool, I had a fertile and productive lemon tree but no desire for an icy granita. Now that the weather’s warmer, the tree has stopped producing just as my desire for a granita is peaking. Unfortunately I don’t really have a thing for granita. Moreover, I can’t be bothered making desserts solely by hand anymore. Technological innovation has spoilt me. That, and it’s freaking cold in Sydney. Cold for Sydney, anyway. Looks delicious and refreshing. Possibly too labor intensive for me…but I’d definitely love to sample some! Great photos and great commentary. I have a file folder full of granita recipes and I’ve never made a single one. I’m not sure I’m up for the scraping honestly, lazy I know. Your post, commentary and pictures makes me want to reconsider. I love serving food in food and lemons (limes and oranges) are perfect everytime. I loved the idea of Lemon an Mint, (my favourite pasta is with that combination)! Because it was Saturday evening and all stores were closed I tried it with one! Lemon and my mint from the little pot on my windowsill. It was delicious!And as a girly plus the ice crystals had an pink hue, because the bottom side of my mint leaves are bright red.thanks for sharing that recipe! Made this today – so delicious. I filled a big glass with it (loosely) and added in about 1/2 a can of Sprite. Oh. Mah. Gah. It might be my new favorite summer drink. Wowza…the carbonation and extra bit of sweet from the Sprite make it transcendentally refreshing. But we’re adults now. And the darned plastic churn was REALLY hard to operate. I guess being older and slightly wiser does have some perks. Wow- thank you for this recipe! I have to say, it looks rather unassuming, but it is addicting! Funny, I saw that Snoopy machine in Urban Outfitters the other day and I was wondering what the hell it was (live in Europe, I guess it never reached our continent until now). Granitas are great, they remind me of childhood summer vacations in Spain. I’m battling with a tiny appartment freezer but when I upgrade I’ll definitely make this. Made these over the weekend. So delicious and refreshing! The question remains, however, where’s the salted caramel dark chocolate mousse? As wonderful and refreshing as granita is (and I’m on the love boat, here) – you’ve whetted my appetite for the former! One word: Mojito. Use limes instead of lemons, and add some light rum. Serve with a trashy novel and a lawn chair! My new favorite thing ever are granitas. I wish I knew about them when I was pregnant and throwing back Otter Pops like tequila at a frat party. Using the lemons as cups was inspired! I made one last week with pomegranate juice, blueberries and oranges in a simple syrup, and while it was good it didn’t have the lovely texture I see yours has. Gonna have to try this one, thanks! Towards the end of my last pregnancy, I had heartburn so bad the only thing that helped was eating ice. I bet this is easier on the teeth. WHY didn’t I think of that?! with some basil or pineapple sage or your favorite herb. to use a smaller or larger handful. I am so making this tomorrow – after sampling my sugar peas that are a picklin’ as I write! Please try the blueberry ginger granitas at epicurious. So good. Love the sound of this recipe and would like to make it for a cookout this weekend, but I am wondering how far in advance I can make it — does it stay ok in the freezer for a few days (max 3-4)? Definitely. Just re-“fluff” the ice chips before serving it. If I wanted to have 8 servings, would I just double the amount of lemons and basically everything else? This makes far more granita than fits in four lemon cups. So if you want double the lemon cups, yes, but otherwise, I think it can serve 8 as is. Thanks for this amazing recipe! I made it (with 1/2 cup limoncello substituted for some water) for Father’s Day and it was a huge hit! I made these last weekend for a lunch gathering, and to my great disappointment of the 10 people there, six (all of which were siblings and boyfriends) didn’t like it. I was sorely pissed because I loved it. The other five and then moi, LOVED IT; the perfect acidity to end a meal so I won’t crave something sinful five minutes later. Many thanks to you. I tried this recipe with lime and mint this last week, and like John, half the people thought it was too sour. So the next day, I made some sugar water and pack a tall glass full of the granita and pour the sugar water over just to cover to make a thick slush. The naysayers of the night before loved it! this is wonderful! I cant wait to try it out, my mint is growing like crazy and I needed to trim it back….I keep thinking about other flavor combos like rasperry and blueberry but nothing sounds as good as this…does it work with honey instead of sugar? I’ve made this twice since this post went up and I am loving it soooo much. The second time, I cheated and used a couple cups of lemonade. I blended a 1/4 c with some mint, strained it into the remaining lemonade and froze it. Can’t wait to experiment with other flavors this summer! I’ve been looking at these since June, but now that the weather has finally gotten hot and humid, it’s time to give them a shot. A different herb (like rosemary) or some grated ginger might also give this an interesting twist, although mint is sounding mighty tasty right now. Hey there Deb. her in WA where it is 102 today (and you know we don’t have AC) we are adapting this to make pedi-granita! we are using some flavored pediatric juice with electrolytes in place of the lemon, so that the kids don’t get dehydrated today. nobody lies to drink that stuff straight, its like the gunck they make you drink for your glucose test lol. This was perfect. I made this yesterday and it’s gorgeous but I forgot to ‘fork it’ while it was freezing so I have a solid lump of lemon mint ice! Have been scraping bits off with a spoon- tastes fab still tho. Hoping that if I leave it in the fridge for half an hour it might be easier to serve?! looks refreshing, I’ll try it myself. thanks for the recipe. You can make granita with almost any liquid. My favorite summertime choice is watermelon lime with vodka added to it. Mojito sounds like a wonderful idea though. For those of you who leave your granita in the freezer too long….get a Jelly Belly snow cone maker. It’s amazing. I guess a food processor may do the same thing but I just break it with an ice pick and put it in the snow cone maker and it’s lovely shaved granita. Wow! First I love lemons and cant wait to try this out for myself! Second, I just about fell out of my chair when I saw the mention of the snoopy sno-cone machine! I had no idea they still made those and had completely forgotten that they even existed. What a great piece of memorabilia. Thanks for sharing! As the weather has turned hot, I was thinking about the Lemon-Mint drinks we had on a visit to Israel. They were so refreshing! I searched and your recipe turned up, I was surprised you mentioned the drinks from Israel! I am off to the kitchen to try this! Thank You! Great pictures. 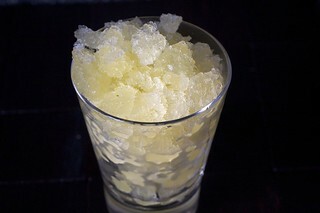 Who would of thought a blog about Lemon Mint Granita would have pictures of that quality. I don’t understand scraping with two forks. Different than scraping with one fork, or a spoon? It’s delicious though! Maria — Faster! Also, well, I find it more fun, raking the ice chips in different directions at once. But it’s hardly mandatory to use two. Ah this takes me back to my trip to Egypt this year, sipping mint lemonades by the beach! So amazing, they actually blend the whole lemon with mint, sugar and water then strain in! Tried re-creating it back home but never as amazing! This granita is really tempting as it is a scorching hot day here in Sydney! Might go whip some up! I’ve been looking at these since June, but now that the weather has finally gotten hot and humid, it’s time to give them a shot. A different herb (like rosemary) or some grated ginger might also give this an interesting twist, although mint is sounding mighty tasty right now!!!!!!!!!!!!!!!!!! These look amazing. What a perfect summer treat, especially for this very pregnant mom! This was such an amazing fun thing to make and it was a HUGE hit for the little kids and adults! We couldn’t stop eating it, and our friends little children refilled his lemon for about 2 hours. It was delicious and so refreshing. I added more sugar for our taste. This is pretty cool! It works. I was about to get a sluch machine and then I saw this post. It works and it’s delicious. Thanks Deb! Can I make watermelon. Would it be the same proportions approxmately. 1 cup juice to 3-4 cups water?